Escape al desierto de los Everglades de Florida en esta aventura guiada de día completo desde Fort Lauderdale. Esta emocionante excursión en grupo pequeño incluye un paseo en bote a través del Parque Nacional de los Everglades, un recorrido por la Reserva Nacional Big Cypress, un paseo por la naturaleza a través de un bosque de cipreses y un paseo en bote por las 10,000 islas del Parque Nacional de los Everglades en busca de una variedad de vida silvestre. . Se proporciona almuerzo (con aperitivos de cocodrilo) y se incluye un servicio de recogida y recogida en el hotel en ubicaciones selectas del área de Fort Lauderdale. Pruebe los aperitivos de cocodrilo durante el almuerzo! El tour en grupos pequeños limitado a 13 personas garantiza una experiencia más personalizada. Después de una recogida en el hotel por la mañana en el área de Fort Lauderdale, nos dirigimos a uno de los lugares más hermosos y únicos del mundo: los Everglades de Florida. En esta excursión guiada por el naturalista, comience con un espectacular viaje en bote de aire de 40 minutos a través de las praderas de aserrín y los bosques de manzana de los Everglades. Luego, súbase a una furgoneta para dar un paseo por la vida silvestre a través de las sabanas de pinos y los bosques de cipreses de la Reserva Nacional Big Cypress. Busque caimanes, tortugas y aves, y esté atento a la esquiva pantera de Florida. A continuación, disfrute de un paseo por la naturaleza debajo de altos cipreses calvos. Aquí se pueden observar caimanes, garzas, garzas y docenas de otras especies en cualquier momento del año. Además, menos visibles pero siempre presentes nutrias, osos, cerdos, ciervos y panteras recorren el desierto local. 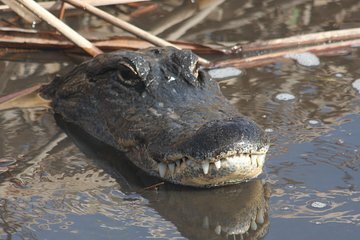 Después del almuerzo, que incluye aperitivos de cocodrilo, súbase a bordo de un pintoresco viaje en bote al bosque de manglares de las Diez Mil Islas en el Parque Nacional Everglades. Este relajante crucero cuenta con manatíes, tortugas marinas, águilas pescadoras y una variedad de otras especies de la vida marina, incluida la cápsula ocasional de delfines que se alimentan en la bahía cercana. El tour concluye con un relajante viaje de regreso al área de Fort Lauderdale. Aviso: Si el hotel no está en la lista de recogida, reúnase en Flamingo Gardens en Davie, Florida. We had a wonderful day doing this trip! We were picked up from our hotel by our guide, Julio. He was super knowledgeable and shared a lot of good information about the animal and plant life and the local ecosystem. We enjoyed the airboat ride and saw plenty of alligators and birds. Then we did a nature hike. Lunch was awesome. The highlight of the day for me was having the dolphins race us on the boat trip at the end of the day! Over all a wonderful trip! Truly recommending this one! Highly recommended: this is a very well thought out tour, and Erin our guide gave us so much good information and interesting stories as we drove from place to place. Seeing the wildlife and birds was as good as I'd hoped, and the lunch was very good. The manatees were there for us the day we went which was a special treat. Thanks to all who helped make it a wonderful day out for us. Very good tour. Everglade boat ride could have been a little better as far as seeing wildlife. But over all was a very nice day long trip. The lunch that was provided was very good with a large portion. Would advise everyone to take the tour. Zak is an amazing guide, very enthusiastic and knowledgeable about the area. He cared that our group had a great time. The boat captains were both competent and helpful. Great variety of locations and we saw loads of birds, alligators, manatee, turtles. Super guide who was very informative. Lovely lunch. Great day out. This is an absolutely marvelous experience for nature lovers and outdoor enthusiasts. Zap was wonderful. Knowledgeable, personable, organized and deliberate in his planning and care of his guests. I highly recommend without reservation. Our tour guide Julio was awesome. He was very informative kept everything on track for the day. We saw lots of birds and Gators. Our lunch stop was great. The Meal was prepared as order and all four of us on the tour thought it was the Bomb for a tour lunch! This tour is for everyone kids included. Everything was top notch on this tour! This was an EXCELLENT tour. The tour guide was very knowledgeable and friendly. We saw literally hundreds of alligators as well as birds, turtles, snakes, fish and dolphins. Would highly recommend this tour. Great full day trip with lots of gators, birds and even dolphins. Knowledgeable guide and smaller group. I would recommend this to anyone!